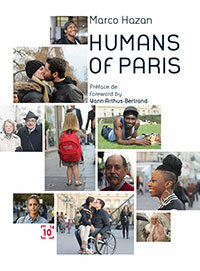 In general, it is possible for you to visit the HUMANS OF PARIS Website without communicating any personal information about you. In any case, you are in no way obliged to transmit this information to HUMANS OF PARIS. However, in case of refusal, you may not be able to benefit from certain information or services that you have requested. In this respect, in fact, HUMANS OF PARIS may be required in certain cases to ask you to enter your name, email address, telephone number, company and function (hereinafter your “Personal Information”). By providing this information, you expressly agree that it will be processed by HUMANS OF PARIS, for the purposes indicated below and for the purposes stated at the end of each form. The controller is NOSTROMO, with its head office at 21 rue d’Aboukir, 75002 Paris – France. Phone : + 33 (0) 1 56 33 99 22. (c) for the purpose of contacting you regarding various events relating to HUMANS OF PARIS. Only HUMANS OF PARIS is recipient of your Personal Information. These, whether in individual or aggregated form, are never transmitted to a third party, notwithstanding the subcontractors to which HUMANS OF PARIS uses (you will find more information about them below). Neither HUMANS OF PARIS, nor any of its subcontractors, sells the personal data of visitors and Users of its Site. Your Personal Information is kept by HUMANS OF PARIS only for the time corresponding to the purpose of the collection as indicated above which can not in any case exceed 36 months. You have the following rights regarding your Personal Information, which you can exercise by writing to us at the postal address mentioned above or by contacting us. However, because of the obligation of security and confidentiality in the processing of the personal data which is in charge of HUMANS OF PARIS, you are informed that your request will be treated provided that you bring back the proof of your identity, in particular by the produce a scan of your valid ID (if requested by our dedicated electronic form) or a signed photocopy of your valid ID (in case of written request). HUMANS OF PARIS informs you that it will be entitled, if necessary, to oppose obviously abusive requests (by their number, their repetitive or systematic nature). To help you in your process, especially if you wish to exercise, for your own account or on behalf of one of your deceased relatives, your right of rectification through a written request to the postal address mentioned above, you will find by clicking on the following link a mail template developed by the CNIL. The exercise of this right is possible only in one of two situations: when the exercise of this right is based on legitimate grounds; or where the exercise of this right is intended to prevent the collection of data used for commercial prospecting purposes. To help you in your process, especially if you wish to exercise your right of opposition by means of a written request addressed to the postal address indicated above, you will find by clicking on the following link a model of mail elaborated by the CNIL. HUMANS OF PARIS agrees to respond to your request for access, rectification or opposition or any other request for additional information within a reasonable period of time that may not exceed one month from the receipt of your request. HUMANS OF PARIS informs you that it uses its authorized service providers to facilitate the collection and processing of the data that you have communicated to us. These service providers may be located outside the European Union and have the data collected through the various forms on the Site. If you consider that HUMANS OF PARIS does not meet your obligations with respect to your personal information, you may make a complaint or an application to the customary authority. In France, the competent authority is the CNIL to which you can address a request electronically by clicking on the following link: https://www.cnil.fr/fr/plaintes/internet. HUMANS OF PARIS, as publisher of this website, will be able to implement a cookie on the hard disk of your terminal (computer, tablet, mobile etc.) to guarantee a smooth and optimal navigation on our website. The information collected through cookies does not in any way identify you by name. They are used exclusively for our own needs in order to improve the interactivity and the performance of our website and to send you contents adapted to your centers of interests. None of this information is the subject of a communication to third parties except when HUMANS OF PARIS obtained your prior consent or when the disclosure of this information is required by law, by order of a court or any authority administrative or judicial authority to know. To better inform you about the information that cookies identify, you will find below a table listing the different types of cookies that may be used on the website of HUMANS OF PARIS, their name, their purpose and their shelf life. You can accept or refuse the deposit of cookies at any time. When you first log in to the HUMANS OF PARIS website, a banner briefly outlining information about cookies and similar technologies will appear at the bottom of your screen. This banner warns you that by continuing your navigation on the website of HUMANS OF PARIS (by loading a new page or by clicking on various elements of the site for example), you accept the deposit of cookies on your terminal. You are also deemed to have consented to the deposit of cookies by clicking on the “Ok” icon to the right of the banner at the bottom of your screen. In accordance with the recommendations of the Commission Nationale Informatique et Libertés (CNIL), some cookies are exempt from the prior collection of your consent to the extent that they are strictly necessary for the operation of the website or have the exclusive purpose of allowing or facilitating electronic communication. These include session ID, authentication, load balancing session cookies as well as cookies for customizing your interface. These cookies are fully subject to this policy to the extent that they are issued and managed by HUMANS OF PARIS. Because such cookies are issued by third parties, their use and deposit are subject to their own privacy policies, which you will find below. This cookie family includes audience measurement cookies, advertising cookies (which HUMANS OF PARIS does not use) and social network sharing cookies (including Facebook, YouTube, Twitter and LinkedIn ). Audience measurement cookies provide statistics about the use and use of various elements of the website (such as the content / pages you visited). These data contribute to improving the ergonomics of the website of HUMANS OF PARIS. An audience measurement tool, Google Analytics, is used on this website. Social network sharing cookies are issued and managed by the publisher of the social network concerned. Subject to your consent, these cookies allow you to easily share some of the content published on the website of HUMANS OF PARIS, including via a “button” application sharing according to the social network concerned. Several types of social sharing cookies are available on the HUMANS OF PARIS website: Facebook, Linkedin, Twitter, Google +, Pinterest, Tumblr, Reddit. You can find their policies on cookies on each social network. ATTENTION: We draw your attention to the fact that the refusal of the deposit of cookies on your terminal is nevertheless likely to alter your user experience as well as your access to certain services or functionalities of this website. If necessary, Humans of Paris declines any responsibility concerning the consequences related to the degradation of your navigation conditions which intervene because of your choice to refuse, to delete or to block the cookies necessary for the functioning of the site. These consequences cannot constitute damage and you cannot claim any compensation for this fact. For any query or additional request for information on this cookies policy, contact us.